Some people believe in doomsday, but nobody expects that the end of the world could be caused by a host of mad cows launched from the ground like missiles. 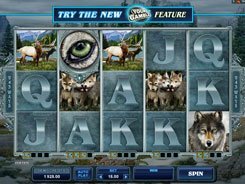 Apocalypse Cow is a nicely designed Microgaming-developed slot machine with three reels and a single payline. 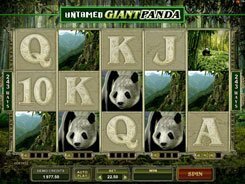 The slot accepts one coin per line, per spin, yet its denomination is adjusted from $0.1 to $10. 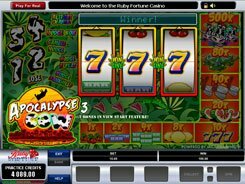 On the reels, you will encounter traditional fruit symbols, including cherries, bars, lemons, sevens and watermelons. These are accompanied by dog tags and army helicopters that add a military twist to the gameplay. 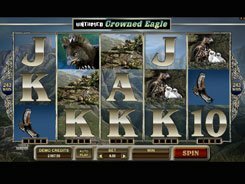 Get three of a kind, and be awarded a win of your bet times x1–x80. The Cows symbol grants the first jackpot of x500 times a bet if these three hit the payline. Three Steak symbols activate a wheel of fortune type bonus round. 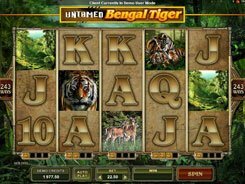 During the feature you can win cash, free spins and eye-boggling multipliers of up to x500. 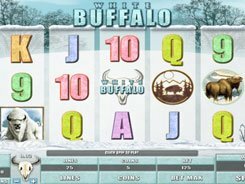 Being a low-stake slot, Apocalypse Cow will appeal to players with a modest gambling budget, and to all aficionados of Microgaming’s products. PLAY FOR REAL MONEY!